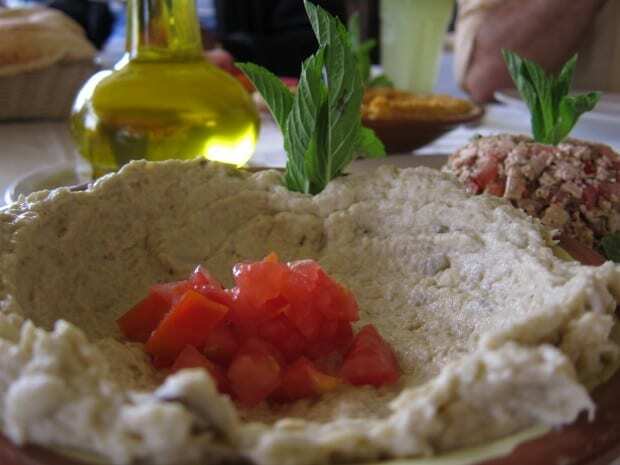 There’s a common misconception that mouttabal (also spelled moutabbal or muttabal, depending on the country) is the same thing as baba ghanoush. In many North American restaurants, the two are used interchangeably on menus when in practice they are actually different dishes deriving from one main ingredient: roasted eggplant. As a result, both have a deep smoky taste that languishes on your tongue after each bite. While mouttabal and baba ghanoush are each found within the Levant region, their similarities end with the roasted eggplant and seasonings like lemon juice and garlic. It was mouttabal – and not baba ghanoush – that remained a staple throughout my travels in Jordan. So what is the difference? Mouttabal (or as it’s called in Lebanon mutabal batinjan) is a dip made from roasted eggplant and sesame paste (called tahini), as well as yoghurt. Olive oil, lemon juice and salt are added for seasoning, resulting in a creamy, flavourful and very filling dip. Baba ghanoush has more ingredients but a lighter feel, combining fresh chopped parsley, tomato, chives and often a mix of green and red pepper. These are folded into the eggplant and it too is seasoned with oil, lemon juice and garlic. In some countries, the peppers and chives are replaced with pomegranate molasses and walnuts; either way it’s delicious. Moutabal figured prominently in my meals throughout Jordan, be it as an appetizer prior to roasted lamb or chicken, or as a small Lego block in a meal of mezze, rounding out the flavours with its soft smoky taste. It was fun to compare all the different recipes and textures, some with chunks of eggplant and others puréed to a smooth, consistent paste. I used to hate eggplant as a kid, offput by its stringy consistency and strange thick taste. 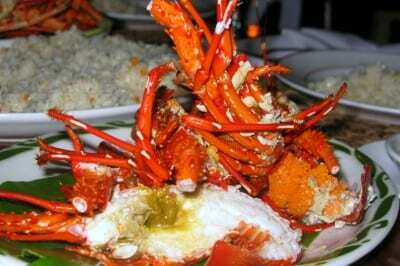 But as I got older, it grew on me exponentially and nowadays it’s one of my favourite ingredients in food. 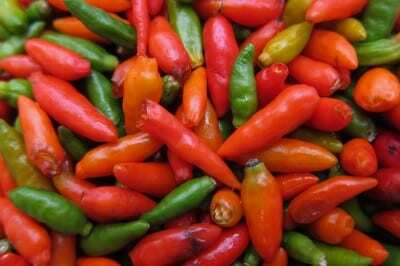 I’ve had the pleasure of trying eggplant dishes around the world, from fiery Sichuan masterpieces laced with numbing peppercorns and topped with chilis, to equally fiery Laotian dips that left the restaurant staff laughing at the tears pouring down my face. The eggplant dishes in the Middle East are rarely spicy, but what they lack in chili they make up for in taste. Every bite of moutabal was one I savoured, no matter how many times I ate it. 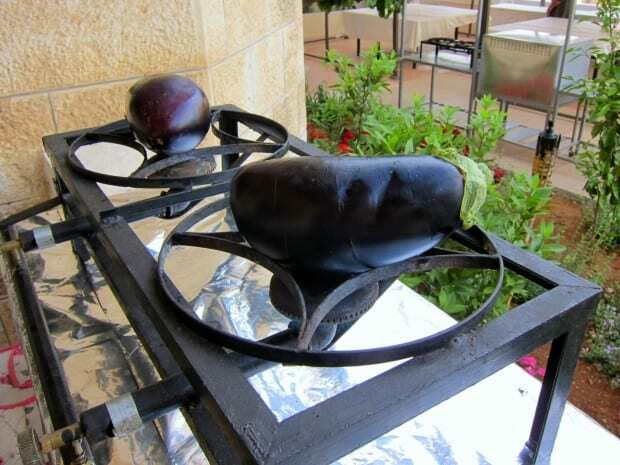 Roast the eggplant on an oven top for about ½ hour, turning frequently. 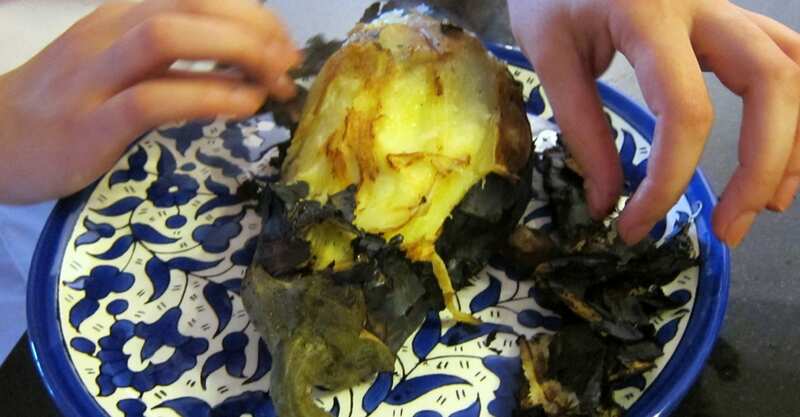 If you do not have a gas stove or BBQ, poke some holes in the eggplant and let it roast in the oven. Allow eggplant to rest for 10-15 minutes, then run it under cold water from a sink and slowly peel using your hands. 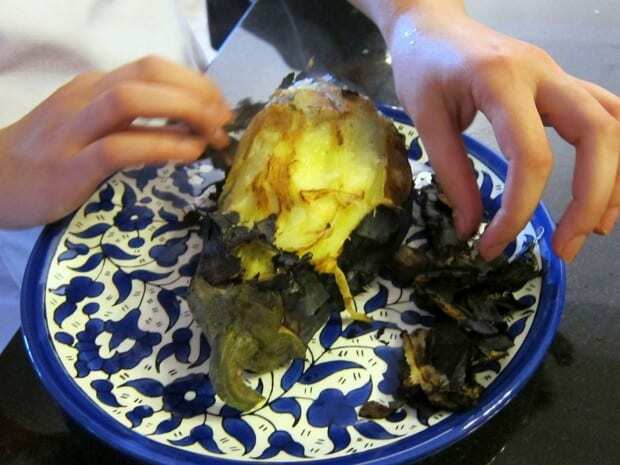 Remove the stem and place the flesh into a plastic container. Run a knife through the flesh to separate it, add the juice of 1 ½ lemon, 2-mashed garlic cloves, salt, ½ cup of tahini and 2 tablespoons yoghurt. Mash the mixture using a spoon or a mortar and pestle and mix well. Spread on a plate and garnish a light drizzle of olive oil. Easy and a great dish to serve with fresh pita or crackers before a summer meal. I used to hate eggplant as a kid as well (or aubergine if you were trying to be posh). I put that down to no one in my land knowing how to prepare it. Greek and Middle Eastern migration to Australia improved this situation at least, and I now a happy eggplant eater, at least in Mouttabal form. Well, posh or French ;) It’s true that eggplant can be one soggy mess of a dish when prepared badly. I’m glad that, like me, you’re now in the pro-eggplant group. So many terrific dishes to make using eggplant, and they’re often very easy to prepare. Thanks for reading! Thanks for posting the recipe! I can’t wait to try it. I do enjoy your photos and posts; always interesting to catch up with your latest passions. Thank you Becky! I plan to craft a bit of a series about the foods from Jordan, and Beit Sitti has been kind enough to supply a slew of recipes so most of them will include a ‘how to make this at home’ portion too. I have to remember to eat before writing, however…yesterday I didn’t, and I was drooling over my computer! Love the idea of mixing yogurt into the smoked eggplant. We make baba ghanoush all the time at home — we pierce the eggplant with cloves of garlic, roast the whole thing, then peel, and grind with lemon, tahini, etc. — but next time I do it, I’m going to stir in some yogurt. I discovered baba ghanoush a few years back after finding myself with too many eggpl….gnnn, *aubergines* following a moussaka I didn’t make. Loved it dearly (scooped out with shards of toasted sesame-seeded flatbreads). Yeah. I’m sold. I have to have a go. Yum – thanks for sharing the recipe. 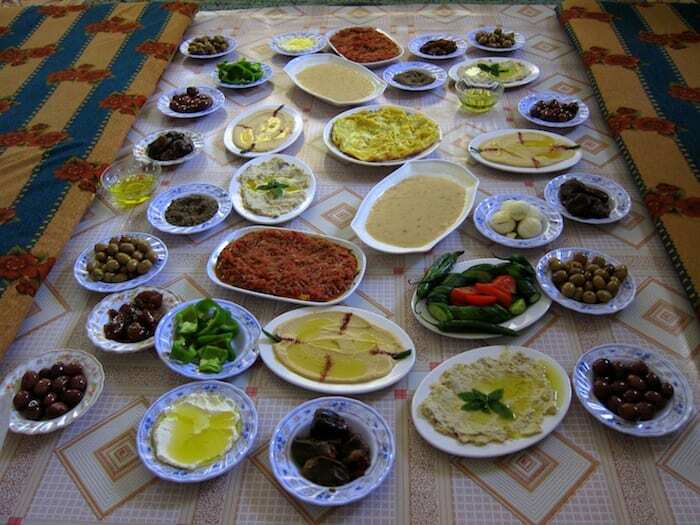 My host-‘mom’ made this for me all the time while in Jordan – it was one of my favorites along with Foul (bean dip) – did you try that? What I loved about living with a family in Jordan is that they taught me how to cook too! Thanks for sharing the recipe Jodi – this is the first thing I’m going to try out when I get back to Sydney. Hoping this is the shape of things to come for posts from you…always love trying new recipes! I appreciate now knowing the distinction between the two. It must have been a fun cooking course. I’m no whiz in the kitchen but taking cooking courses as I travel has become a regular part of my journeys. It was a fun course, definitely! Like you, I try to take classes or sit in on a street stall somewhere to learn how food is made as I travel. It’s a terrific way to get to know a new place. 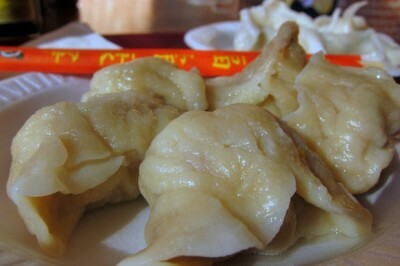 If you try this recipe, do let me know! this is wonderful! i usually only buy japanese eggplants so i never know what to do with the other kind!! I’ve got to try this! Terrific! Hope you enjoy the recipe. Sounds delicious! I used to feel the same way about okra as you did with eggplant. Personal tastes definitely change as we get older.